There have been a number of people throughout the last year who have asked how I fit everything in – LegallyFit, lawyering, working out, meal planning, being a wife, a friend, and a mom. I am exhausted just thinking about it! But . . . you know what? It doesn’t feel like I am cramming things in for a few reasons: (1) I love everything I do and make time for in my life and (2) I have an incredible tool that helps me prioritize and stay on track – enter the Passion Planner. With 2016 just days away, all of us have one thing on our minds – new year’s resolutions. 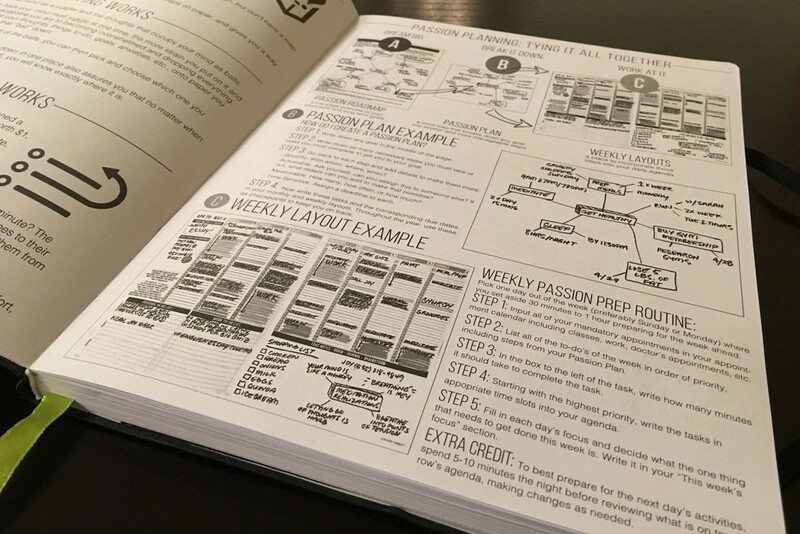 The Passion Planner is the perfect tool to help you figure out what to commit to and how to get there. Honestly, my Passion Planner is single-handedly the most helpful tool I have to accomplish not only my daily, but life-long goals. Let me explain. This planner is more than a daytimer, it is a creativity, passion driver that leads you to chart your own goals and set course to reach them. You start off the year spending time doing guided reflection and working through identifying where you want to be in 3 Months, 1 Year, 3 Years, and during your Lifetime. You start off and dream big for five minutes, listing everything you can possibly imagine in that timeframe. Then comes the fun part – you break down these high level goals and prioritize them based on what is important to you. Once that is done, you create what is called a “Passion Plan,” adding specifics and timelines to create small benchmarks on the road to your goals. Crazy thing – it works. I became addicted to my Passion Planner after discovering it on kickstarter.com about a year ago. Through my Passion Planner in 2015, I successfully launched LegallyFit.com, made a significant career change from traditional large firm law to in-house at the Happiest Place on Earth, trained and recorded my personal best half marathon time, lost 10 pounds of fat, prioritized my family time to ensure it happened, and made countless commitments to my future. With 2016 around the corner, I am gearing up to make new commitments and goals. Just yesterday my 2016 Passion Planner arrived in the mail, and trust me, it’s going to be put to good use! If you want to download the Passion Planner for free, you can do so here. However, I’d recommend investing the few bucks to order a hard copy – it seriously goes with me everywhere. If you do end up purchasing one, be sure to say that we referred you – we’d love for them to know how much we heart their product! Cheers to the New Year and new goals.